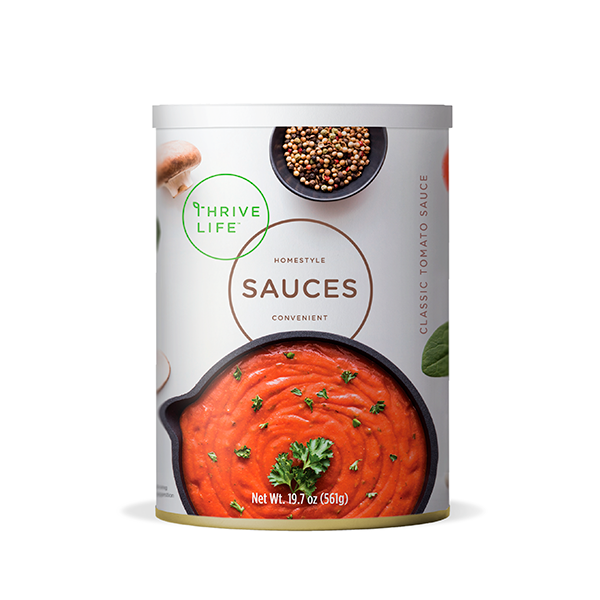 THRIVE Tomato sauce makes it easy to prepare countless family favorites. This rich red sauce is a staple for quick and easy pasta, pizza, or tomato soup! TOMATO POWDER, MODIFIED FOOD STARCH, SUGAR, WHEY, CREAM, SALT, GARLIC, ONION POWDER, NONFAT DRY MILK, SPICES, CARROT POWDER, DEXTROSE, ONION, MALTODEXTRIN, CHIVES, NATURAL FLAVOR, RED ONION, CITRIC ACID. Shake mix well before using. Slowly add 1/2 cup mix to 2 cups hot water and stir well. Simmer for 2-3 minutes and let rest 1-2 minutes. Makes 2 cups sauce. This mix thickens up more than our tomato powder and is already seasoned, making it a great choice for making pasta sauces, marinara for dipping, and more. Just add our Sausage Crumbles for instant spaghetti sauce! It's also an easy 5-minute pizza sauce, and a base for tomato soup or bisque.